It occurs when I cast something like Liquid Lightning, then a wider one such as Caltrops or the destruction staff ultimate. This image was after LL + Destro Ulti. 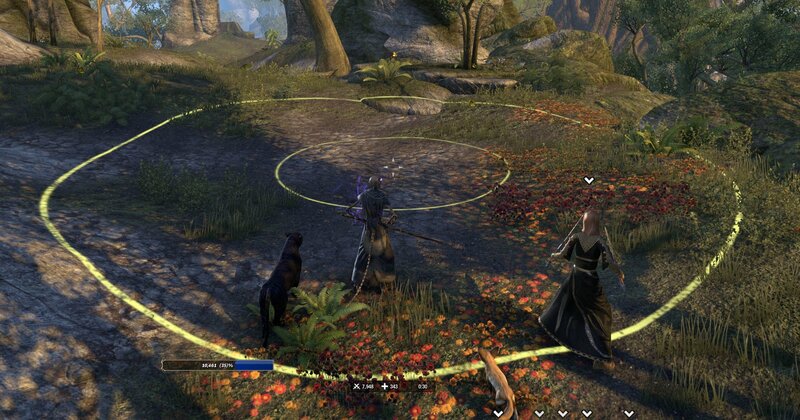 Sometimes this can stop me being able to activate one of the spells, almost as if the game is getting confused as to which radius I should be casting for. This can cause me some significant problems, especially when doing vet content and those DoTs are essential. This seems to have appeared since the last patch update. This happens when you use the Desto Staff ultimate. If you play a magicka sorc, you will see this bug constantly during normal play. - Try to use Liquid Lightning right after. The yellow circle will be messed up, and it sometimes will stop you from activating the ability. To fix this, you have to switch bars and back. Thanks for that insight - I am on a mag sorc when it happens. Switching bar will help enormously.